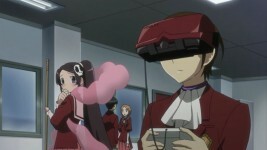 This week, Keima gets the shock of a lifetime which may or may not result in him violating his contract with Elcie. 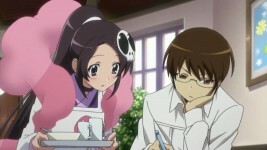 The episode starts off normally enough with Elcie helping out in the family’s cafe while Keima is plugging away at what appears to be homework. Noticing his stern expression, Elcie wanders over and asks what he’s doing. He tells her that he’s trying to figure out how much gaming time he’s lost as a result of helping her capture loose souls. Just as he’s about to solve the equation, he looks up and asks Elcie how many souls are left since they’ve already caught five (six if you count the one Elcie handed over to Haqua). Just as Elcie is about to answer him, Keima’s mom calls for her to help her with something and Elcie runs off. She returns a few minutes later holding up something and happily tells him that there’s only about 60,000 more souls left to capture. Keima then does one mother of a head-meet-desk moment, and even the sound of his head colliding with the table made me wince in sympathy pain. That could not have felt very good. The next day at school, Elcie is complaining about how she hates Mondays because they always make the week seem so long. Her friend Chihiro Kosaka tells her to think of the week starting on Wednesday instead of Monday because then it won’t seem so long. Elcie tries it and is suddenly excited because they’re “in the home stretch”, but notices that Keima is sulking at his desk. She heads over there and tells him to cheer up and think of the week starting on Wednesday instead of Monday, but Keima shouts at her, saying that’s not why he’s upset. He clarifies for her, saying that he’s upset that there’s still so many souls to capture before going on to say that you only need seven orbs to summon the dragon (can anyone guess that reference?) and having 60,000 orbs would be suicide. Elcie tries to comfort him by saying that there are other Loose Soul Team members on the hunt, so it shouldn’t take too much longer. This depresses Keima even more and he mutters that since their section chief let a soul go, he doesn’t have much faith in the other team members. At this point, Chihiro starts making fun of Keima after Elcie asks for her help in cheering him up. 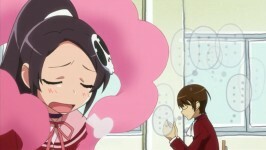 She laughs, saying that she’ll catch “dweeb cooties” if she helps cheer him up, which only irritates Keima more. After class, Keima is still bitter about Chihiro’s comments and exclaims that he hates real life women because they’re all the same. Elcie seems confused, so he gestures at everyone in the hallway and points out that nearly all of them have the same hair color and that none of them have any redeeming features. Unfortunately for him, someone runs past them and Elcie’s loose soul detector starts blaring, alerting them of another soul to capture. 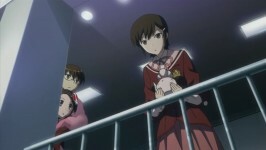 They follow the girl and Keima is shocked (and possibly horrified) to find that his next target is none other than Chihiro. Outside, Keima is laying about in a daze, saying that he refuses to play her plot line. Elcie tries to tell him that the loose soul will only grow in power if they don’t capture it right away, but Keima dismisses her saying that no one will notice one or two souls that aren’t captured. Elcie tells him that they can’t do that, but before Keima can say anything else, they spot Chihiro with someone else. It turns out that she’s confessing her love to another classmate, which stuns Keima because according to him, there has never been a game where the heroine was in love with someone else (this is because gamers would burn the company to the ground). Elcie then drags him off because he’s in too much shock to move himself, but Chihiro runs past them, tears in her eyes, and it appears that she was rejected. Later that night, Keima seems to be worried about Chihiro (and possibly the fact that she has a loose soul using her has it’s host) but doesn’t answer any of Elcie’s questions on the subject. The next day, Elcie is worried about Chihiro because she’s late to class, but is happy to see that she does eventually show up. She apologizes for overhearing her confession the other day and Chihiro says that it’s okay. She appears to be so depressed that Keima really is worried about her and gets up to say something (while going through his mental Rolodex of possible opening lines) when Chihiro exclaims that it’s no big deal and it’s time to go on to the next love in her life. This stuns and infuriates Keima and he begins to shout at her, saying that if she can move on from one man to the next, then she’s not experiencing true love. This irritates Chihiro and she starts shouting back at him, saying that he doesn’t know anything about love because he’s always so absorbed in his games and mocks real life. Apparently her words got to him because he somehow turns into a cockroach (I’m still not sure how that happened) and skitters away, saying that he refuses to help anyone in real life ever again. After this, Keima engrosses himself in gaming, even going so far as to lock himself in his room at night and wear those big, clunky 3D glasses and such during school hours. We then see a montage of Elcie trying valiantly to lure Keima out of hiding, but everything fails, so we see her staring at his door through all four seasons. However, the next day (or what I’m assuming to be the next day) Keima emerges from his room but goes straight to school without saying anything to his mother or Elcie. Elcie follows him, worried for his well-being, but isn’t able to do much. 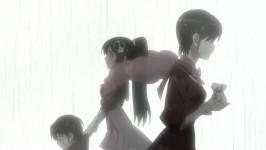 Once at school, Keima collapses and Chihiro comments that he picked a fight with her and now he’s all depressed. Someone murmurs something before walking out of the classroom. 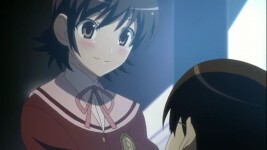 Turns out, it’s Ayumi – the first girl Keima conquered – and she goes to see him and tells him to cheer up. Opinions: I hate to say it, but I’m glad Haqua wasn’t in this episode. 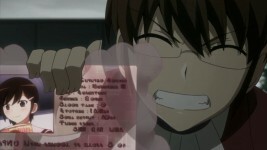 It was an excellent episode and quite hilarious in the fact that Keima immersed himself in gaming because he was so depressed by what Chihiro said. This gives us a clue that Keima does actually care about what other people say or think about him. Since Chihiro really has no redeeming qualities (no clubs, average grades, etc.) 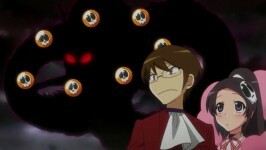 it will be interesting to see how Keima will conquer her or if he will even try. The fact that Ayumi went to see Keima to try and cheer him up was sweet, but I wonder how that will play into the next episode.